CHINA is urging its top wind and solar power production provinces to prioritise transmission of renewable energy over conventional energy sources as it seeks to get more clean power onto the grid. 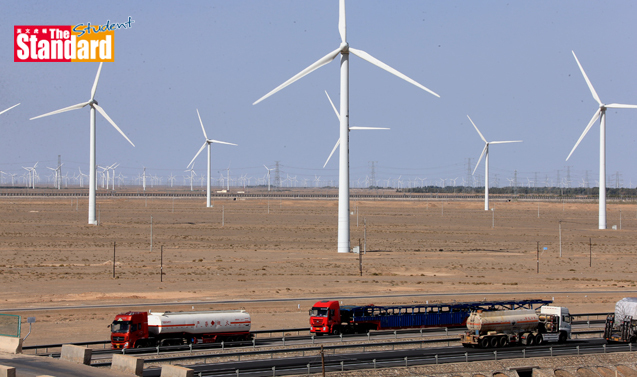 China has installed more wind farms than any other country but not all of the power generated by the projects is used, due to curtailment, which is a shortage of transmission capacity to connect projects in remote regions to end users. More than 15 percent of energy generated by wind power in the first half of this year suffered from curtailment, according to official data. Grid companies typically favour conventional energy sources like coal and hydroelectric power over less stable renewable energy sources, which also require more investment on grid connections and government-subsidised feed-in tariffs. The country’s top economic planner has urged northwestern regions Gansu (甘肅) and Inner Mongolia (內蒙古) to launch pilot projects to tackle the issue, including increasing consumption of renewable energy locally. “Renewable energy should be given priority, complemented by conventional energy in a local network with peak shaving, in order to reduce the need for constructing grid capacity to export electricity,” said a document released by the National Development and Reform Commission (國家發展和改革委員會). Though the regions should build more transmission lines to increase outbound capacity, the authority also urged them to attract more energy-intensive industries from China’s east, helping to better absorb the supply of renewable energy locally. “We welcome local renewable energy generators to participate in and scale up direct power trading, providing alternative sources of power for electricity and heating, cutting prices for industrial users, and increasing power use and consumption as close as possible to the source of production,” added the NDRC.